A forklift driver can earn a lot of money. It’s a well-paying career for someone who doesn’t have education after high school – and that’s saying something. Most jobs require an Associate’s or Bachelor’s degree, but a forklift driver (with the right certification) can make $40,000 to $50,000 per year. And in some cases even more than that, if they work overtime. But where are the best cities to find those good-paying jobs? As your might expect, the urban areas with the most people also have the most businesses. Here are the best cities in the United States to find a forklift job. Keep in mind, many places may have higher living expenses (housing, food, bills, etc.) than you have right now. So if you’re looking to move somewhere, that’s definitely something to consider. According to the Bureau of Labor Statistics, the U.S. states with the highest employment levels in 2016 were Texas, California, Pennsylvania, Georgia, and Illinois. When finding a forklift job, you won’t find a hard time finding work in one of these states, or in any of the major cities listed below. If you’re looking for the highest paying metropolitan areas in the U.S., the BLS states that Houston, Chicago, New York, Los Angeles, Dallas, Riverside, Atlanta, Phoenix, Minneapolis, and Charlotte are the top income-earning cities to look in as a forklift operator. Let’s look at the four largest cities in the United States (New York, Los Angeles, Chicago, and Houston) to see why these metro areas are outstanding destinations for anyone looking for a forklift driving job. If you’re looking to take your career to the next level and want to make as much money as possible, or if you’re simply looking for a change of pace with your forklift driving job, you’ll definitely want to consider these four cities. Beyond these major four forklift job markets, there is a wealth of opportunity out there for hard-working, well-trained forklift drivers. Despite increasing automation, forklift drivers will remain in demand for years to come. With quality training and instruction from ForkliftCertification.com, you’ll be in the running for forklift jobs in major cities and smaller markets, too! 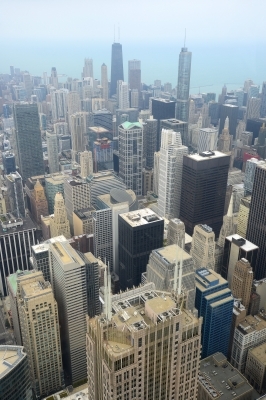 Chicago – only two cities (New York and Los Angeles) have more people than Chicago. The city has a large industrial base, with plenty of warehouses, dockyards and other places that use forklifts. Chicago is always a great place to find a forklift driver job. What’s more, Chicago is considered a major travel and transportation hub in the U.S. Midwest region. The city also enjoys a vast railroad network leading in and out of the city, and there are always forklift job postings related the rail industry. Plus, one of the largest airports in the country – O’Hare International Airport – always requires forklift operators for airplane maintenance, luggage & cargo transport and much more. Chicago makes an ideal employment target for forklift drivers throughout the Midwest and Mississippi Valley region. If you’re looking to find a forklift job and you live in Illinois, Iowa, Indiana, Wisconsin, Kentucky, Missouri and other surrounding states, keep Chicago on your career radar! Houston – right behind Chicago in population, this largest city in Texas is close to the Gulf of Mexico, so many shipyards and loading docks are in Houston. Plus, it’s cheaper to live in Houston than other big cities. Houston is the fourth-largest city in the United States, and population growth projections mean that forklift drivers will continue to enjoy plenty of job opportunities here. The city is also considered one of the most important energy, transportation, and technology centers in the U.S. What’s more, the city is located at the crossroads of two major highways, I-10 and I-45. With world-class roads, a strong industrial base and growing technology presence, Houston is positioned as a prime forklift job center. If you want to find a forklift job, Houston is always hiring! New York – the Big Apple is also a big forklift driver employer. The city’s location along the Atlantic Ocean and many businesses means that products are always being shipped there. However, New York is one of the most expensive places to live. Even with the high cost of living, however, New York City’s considerable commerce activity, transportation infrastructure and vicinity to the Lower Hudson Valley means that the Big Apple is always ranked as one of the best places to find a forklift job. Many forklift drivers from Eastern Pennsylvania, upstate New York and New Jersey find employment in New York City. Los Angeles —LA is home to beautiful weather and plenty of opportunities for forklift operators. From the many retail warehouses to jobs on movie sets, jobs in LA offer some of the most varied in the nation. You might even have luck finding a forklift job in the movie industry for set and prop workers! The outskirts of the city, particularly along the I-710 and I-110 corridors toward Long Beach (one of America’s busiest deepwater ports) offer tons of forklift jobs in warehouses, shipyards, docks, distributions centers, manufacturing hubs and more. While Los Angeles is known for glitz and glamour and might not seem like an ideal place to find a forklift job, it’s one of the best cities to work as a forklift operator. Nationally, the job sector with the highest percentage of industry employment and the highest annual mean wage is Warehousing and Storage. For the best chance at finding a forklift job, head to one of these top-earning cities for an awesome career as a forklift operator. Where Can I Find a Forklift Certification? Before you can begin finding a forklift job to apply to, you need to complete a forklift certification. Many companies in different cities rely on ForkliftCertification.com to provide the best forklift training possible. Firms such as Fuji Film, Dow Chemical, Coca-Cola, Verizon, Jenny Craig and Georgia-Pacific have used our forklift, scissor lift and aerial lift training programs. Our low prices and detailed courses are great for new forklift operators looking to become certified, and they’re also ideal for veteran drivers that need updated training. We teach everything workers need to know to operate forklifts safely, perform basic inspections, and prevent accidents that cause injuries, fatalities, equipment damage and fines each year. Our programs are 100% compliant with OSHA so you won’t have to worry about being slammed with costly fines or legalities. For only $299 for the complete forklift training kit and in only about one hour from start to finish, you or your employees can be trained and qualified for finding a forklift job. Besides being compliant with industry regulations, the benefits to completing forklift certification include qualifying for higher paying jobs, increasing productivity in the workplace, and saving money and time to increase your bottom line. And with our online testing method, you (or your drivers) will have OSHA-certified training in no time at all. See why ForkliftCertification.com is such a popular option for companies across the country. Our training includes our Training Kit, Train a Trainer and Bundle Package courses so you can certify your workers for every type of forklift driving position (including supervisors and trainers), all in one convenient place. If you’ve found a forklift job in your city or want to increase your chances of getting a job, please visit our contact page or call at (602) 277-0615. We can help you get the forklift job you’ve wanted. Employers always want the best-qualified candidates – it’s true for employees in every industry and job sector, including forklift operators. With OSHA-compliant forklift training from FLC, you’re giving yourself the best possible chance to find a forklift job, no matter where you live! Thanks for considering our service; make sure to check out other blog posts. We appreciate your business.